“J.K.” glass | That Belongs in a Museum! 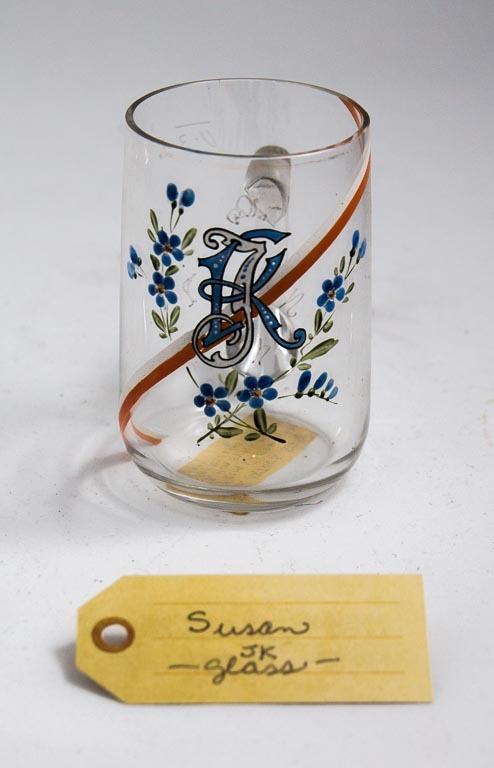 …this object [a glass mug] goes into the Museum of Aliases. This is a glass from what was then Czechoslovakia, and it was made for my grandfather who was born there…and it says “J.K.” on it. My grandfather’s name is George…and as a kid I would always interview him and ask him questions like ‘tell me about your life’…and I would ask him ‘what’s your name?’ and he would say, ‘my name is George’, and I would say, ‘yeah, but what’s your real name?’ and he’s like ‘it’s George’. So we were cleaning out their house and there’s this mug and on the bottom there’s some scotch tape that my grandmother clearly wrote, where it says this was a stein made for my grandfather, and I was like ‘this proves that your name is not just George!’ because that’s a “J” [monogrammed on the mug]. He was born in Czechoslovakia and his name…his “real” name is the Czech name for George which is Jiri…but it didn’t really matter much to him…to [my grandfather] his name was George…that’s what his identity was.